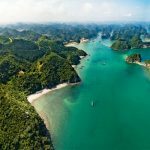 Natural beauty of the Hollywood movie Kong: Skull Island’s film setting in Ninh Binh and Halong Bay will be revealed in this discovery tour. 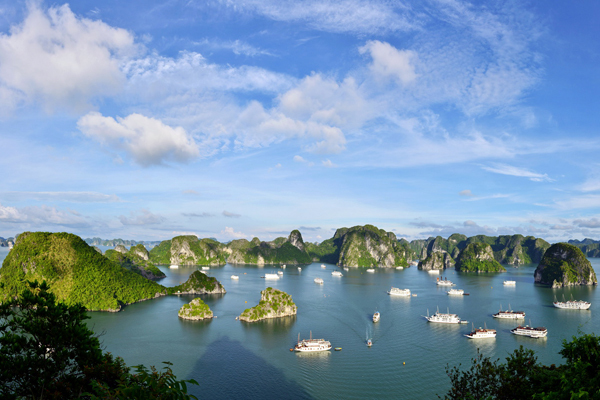 Let’s get excited with picturesque landscape, rocky islands and amazing caves in Ninh Binh or be impressed by the world heritage Halong Bay in 2-night cruise. 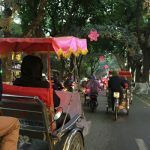 Moreover, you also have a chance to visit Hanoi, the capital of Vietnam and gain some knowledge about Vietnamese culture and tradition. 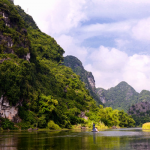 After this tour, you will love Vietnam’s natural sceneries more than ever. 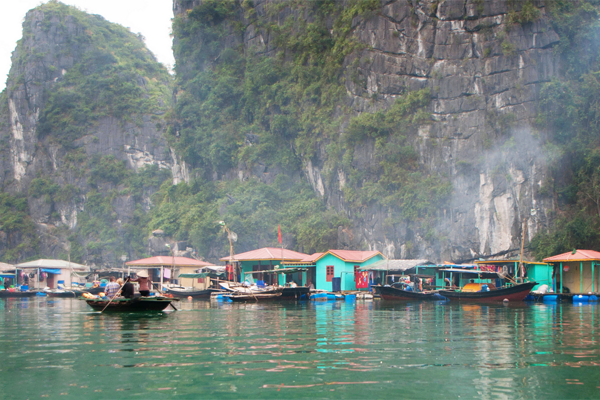 Highlights: Old Quarter, Cyclo Tour, Dong Ngac Village, Hoa Lu Citadel, Van Long Natural Reserve (Kong Film Location), Ha Long Bay(Kong Film Location), Bai Tu Long Bay, Vietnamese Cooking, Vung Vieng Floating Village. Take the warmest welcome from our guide upon arrival, you will quickly move from Noi Bai Airport to the hotel in the center of the city. 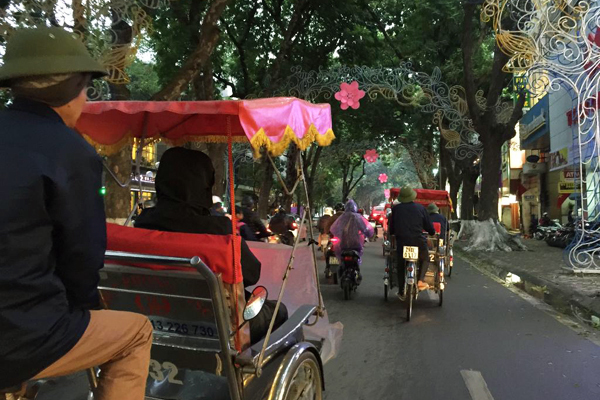 After completing check-in and having a short rest, you will spend about 1 hour on cyclo in order to get authentic insights of Hanoi. 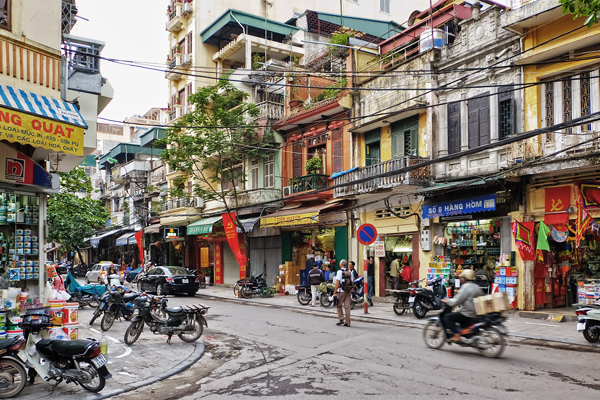 Hanoi Old Quarter, the most popular and crowded area in Hanoi, home of hundreds of small business for ages. Just spend your time leisurely on a cyclo, you are about to discover over 36 old’s streets whose names refer to its typical products. For examples, “Hang Duong” sells sugar and dried fruit, “Hang Bac” sells sliver jewelries, “Hang Chieu” sells mattress, etc. 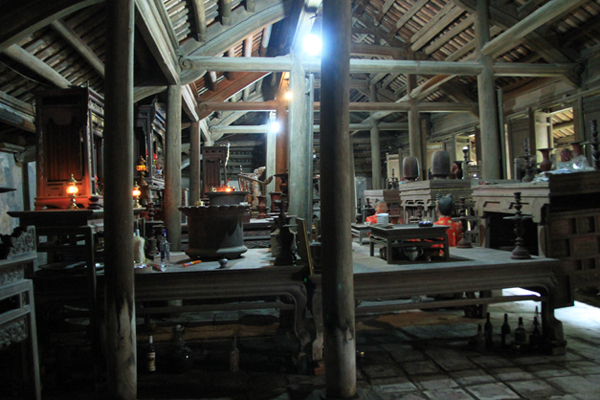 And then it’s time for you to explore Vietnamese traditional art show, Four Palace Show. 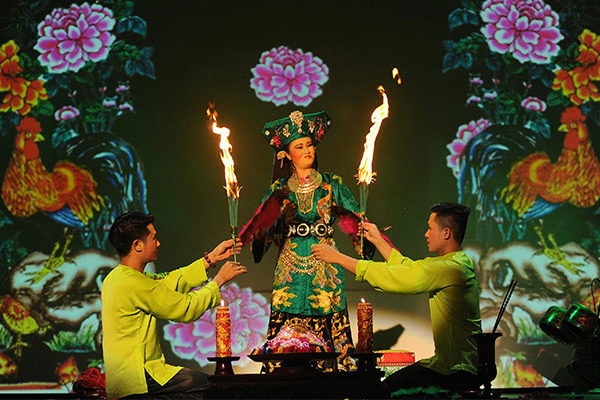 One show just last for 45 minutes and it somehow is a guide into spiritual world of the worship of Mother Goddess, a belief which is still popular in Vietnam nowadays. 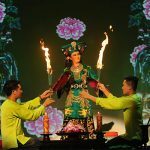 With traditional music, outstanding visual, colorful costumes, lively dance, this unique ritual performance will definitely impress you from the first sight. 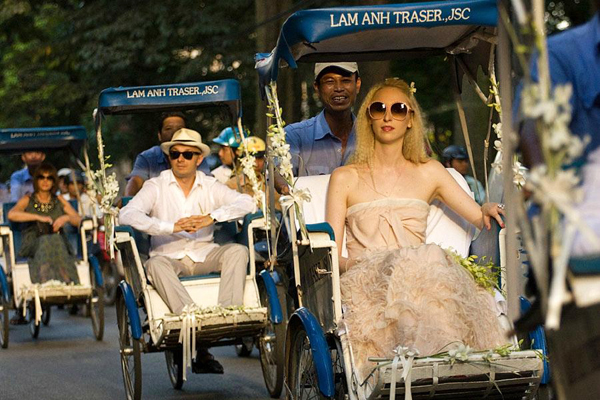 Afterwards, come back to the hotel and enjoy your first night in Hanoi. 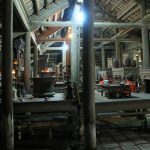 Have breakfast and ready for a trip to Dong Ngac Ancient Village. 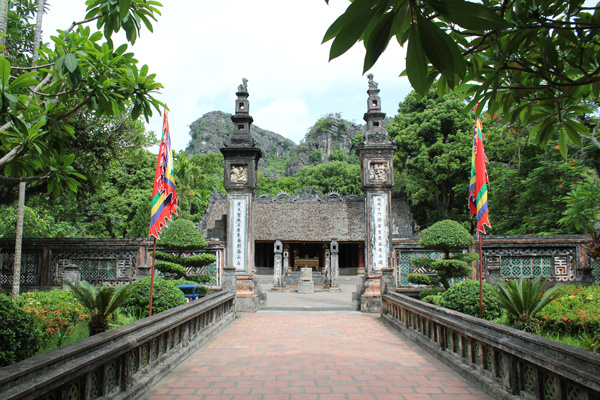 About 8.30AM, our guide will pick you up and take you to Dong Ngac Culture Village which is 15km away from the city’s center. 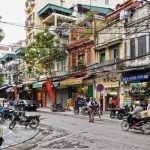 Here, you will be impressed by many traditional wooden houses, paved incline lanes, calm pond, old village gates, etc which is totally different from the density in Hanoi. In this area, they still keep the traditional green campus; the family churches are popular with many precious relics. For just one day, you will have a chance to discover the daily life of Vietnamese locals in the countryside, to feel of their friendliness, enjoy a usual home cook in a Vietnamese family, etc. First, we will stop at a local morning market to see the daily life of locals and purchases some gifts for the family we will visit. Then, take a short walk to the family host for warmest welcome and prepare for biking trip around the village. 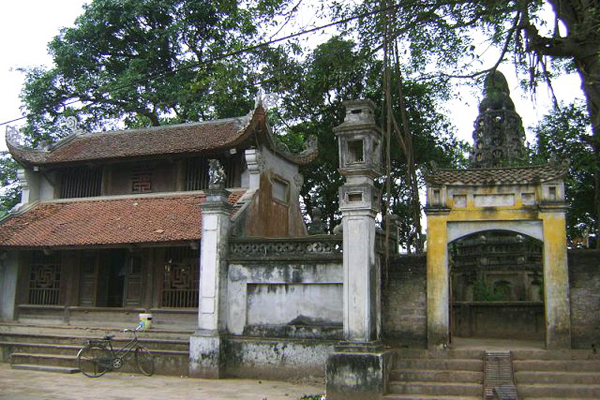 On bike, we will visit some outstanding sites such as Communal House, whose grounds and architecture are built in the shape of a dragon, the oldest house in the village of Do Family which is over 300 year-old, Nguyen Family’s house given by the King and end at the oldest school in the village. Finally, cycling to Tay Tuu Flower Village to see and enjoy the amazing beauty of different kinds of colorful flower. Come back to the hotel in Hanoi and take a rest after a long day. 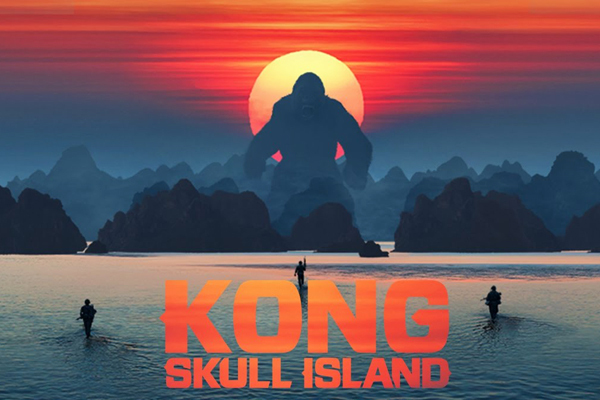 At 8.00AM, say goodbye to Hanoi and spend two hour drive to the South, Ninh Binh Province, the film setting of the recent Hollywood movie, Kong: Skull Island. 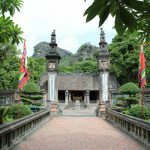 But first, we will visit Hoa Lu, the former capital of Vietnam under Dinh and Le dynasty with two temples worshiping Dinh Tien Hoang King and Le Dai Hanh King. Dinh Tien Hoang had successfully defeated Ngo Dynasty and made Vietnam officially independent from any ruler. 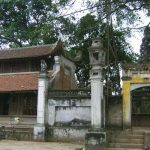 On his death in 980, General Le Hoan wisely married Dinh’s widow and established the Le Dynasty and enlarged the citadel. 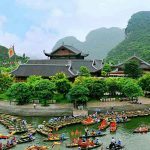 Ninh Binh is not only famous for its historical sites but also for picturesque natural beauty with limestone mountains, beautiful rivers, streams and caves. 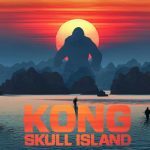 That’s also the reason why the next destination is Van Long Nature Reserve Sites, the film setting of the Hollywood movie: Kong: Skull Island. Van Long Nature Reserve Sites has been known with beautiful natural scenery with rich flora and fauna and quiet atmosphere. Moreover, there is also a vast wetland with rock islands and featured caves, which contributes to the creation of picturesque landscape. 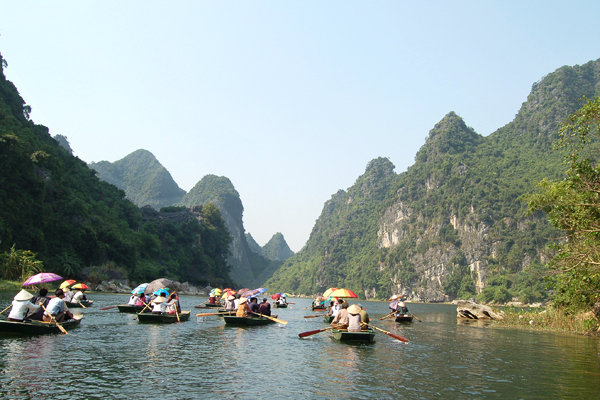 Then, you will have a chance to boat on the wet land and enjoy the peaceful and quiet scenery along two sides. Then, the boat passes through the ravine, flanked by tall rows of grass to caves. 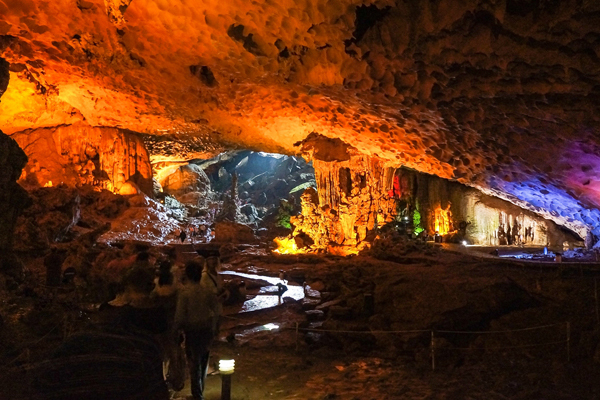 Over 30 beautiful caves such as Fish Cave, Shadow Cave, Turtle Cave, etc appear just in front of your eyes. Just take your time and enjoy the gift from the God. 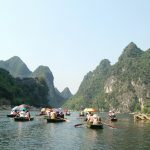 Pick up at our hotel in Ninh Binh after breakfast, we will take 220 KM to Halong Bay – The Bay of Descending Dragon, which is located in the Northeast of Vietnam. 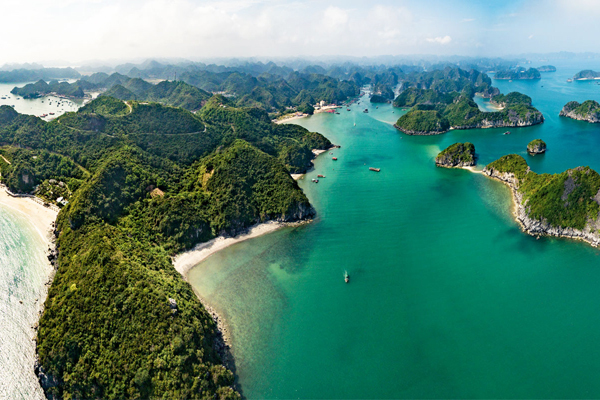 Halong Bay has been recognized by UNESCO as the World Natural Heritage thanks to its universal values of landscape, geology and geomorphology, respectively in 1994 and 2000 and is one of the most beautiful bays in the world. On arrival at Paloma office in Halong City, we will have a short rest before transferring by tender to Paloma Cruise. Enjoy welcome drink while receiving cruise-briefing, check in cabins. 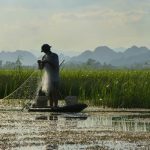 Enjoy a delicious Vietnamese set menu while heading to Bai Tu Long Bay, pass the towns of Hon Gai and Cam Pha, Oan Lagoon, Monster Head and Teapot Islets and Vung Vieng fishing village. 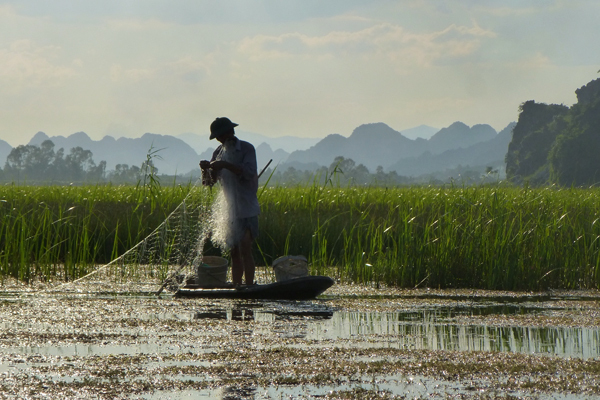 In the afternoon, we will visit the Vung Vieng floating fishing village by bamboo sampan for an hour or kayak into the village. Have a short visit to a Pearl Farm and learn how natural pearls are created. Return to the Paloma Cruise in the late afternoon and join one of the following optional activities: Sunbathing, traditional massage, swimming etc. 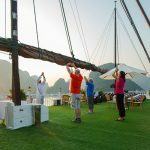 Anchor for the night in the calm water surrounded islets near Hang Trong, enjoy a Vietnamese cooking demonstration on boat and have a sumptuous set-dinner onboard. Our free evening activities can be: Leisure time around the bar, watching movies with many sorts of Vietnam cultural films, playing cards, chess, or just reading magazines. We may also try our luck at squid fishing & fishing from the boat. Overnight at Paloma Cruise. Wake up early in the morning and then have coffee, tea and breakfast pastries served in the dining room. We will then enjoy Tai Chi instruction on the sundeck. 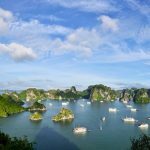 Paloma weighs anchor to sail through several beautiful places such as Drum cave (Hang Trong), Virgin Cave (Hang Trinh Nu), Toad Islet (Coc Ngoi)…After that, we will transfer to another boat for 2-hour cruising to Three Peach Beach. Free time for kayaking, swimming at Three Peach Beach, a pristine natural one lapped by turquoise water (weather permits). BBQ lunch is served on beach (weather and tide permits), we continue discovering Dark and Light Cave, the most remote point in Lan Ha Bay and bordering the Gulf of Tonkin. 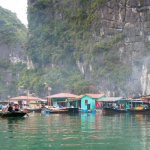 We will visit its quaint fishing village and lagoon with possibility of kayaking through an amazing tunnel under a karst mountain. Return to Paloma Cruise in the late afternoon, the vessel cruises back to the bay for second overnight anchorage near Ho Dong Tien. Dinner and spend the second night onboard. 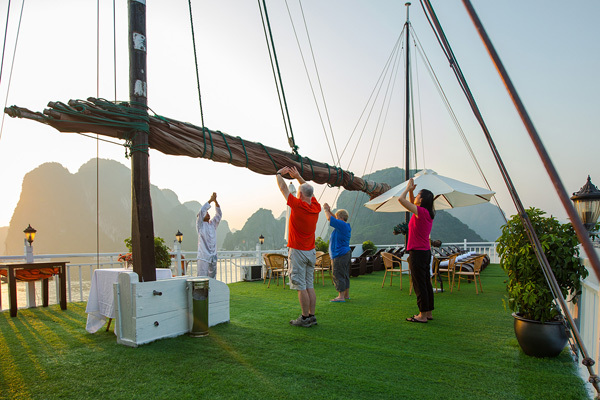 Wake up early in the morning and then enjoy Tai Chi instruction on the sundeck with complimentary tea and coffee. 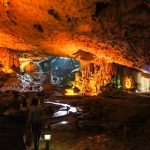 We will have breakfast in the dining room before explore the Sung Sot Cave, walk up about 100 steps to the cave entrance and tour the cave, walk down about 100 steps and return to the boat for (approximately 45 minutes). We will then check out and have lunch while cruising back to the Pier where our car is waiting and take us back to Hanoi. We are free at leisure for last minutes shopping and our awaiting vehicle takes us back to the airport for our flight to home. Trip ends.